Sidney Slon/Staff Photographer The Service for Health, Inequality reduction, Natural disaster relief and Education (S.H.I.N.E.) hosts “How Lucky are You to be Receiving an Education?” in the Fine Arts Building on Tuesday night. In the week before finals, the Service for Health, Inequality reduction, Natural disaster relief and Education (S.H.I.N.E.) has been spreading awareness on issues affecting the Binghamton University and worldwide community. Titled “S.H.I.N.E. Week,” the series of events aims to educate students on the organization’s main areas of focus, as defined in its name. According to Ana Mateo, a member of S.H.I.N.E. and a senior majoring in anthropology, the club plans the week-long series annually. 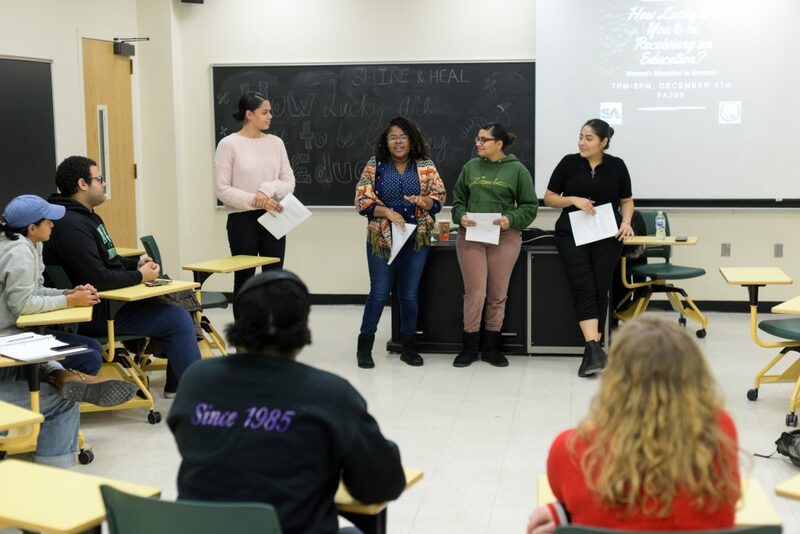 On Tuesday, the organization co-sponsored an event with Higher Education Advocacy Leaders (HEAL), a new on-campus group that advocates for higher education rights, to talk about gender inequalities in Morocco. The discussion focused on the disparity between educational opportunities offered to boys compared to girls in the country. Often, education is extremely important for future opportunities, so those who lack it can be left behind. Imina Emokpae, vice president of S.H.I.N.E. and a junior majoring in integrative neuroscience, said her father’s education allowed him to become a doctor. Students also discussed barriers to education in the United States. Ahjah Renee Adams, a junior majoring in comparative literature, said she doesn’t come from a privileged background and feels extremely lucky to be able to receive higher education. Organizers encouraged attendees to think about ways to address these issues in Binghamton and around the world. They also invited students to come to S.H.I.N.E. events later in the week, which will include a discussion on the recent California wildfires on Thursday.